This feta and watermelon arugula salad is the perfect way to close out summer. Read on and we’ll tell you how to make it. 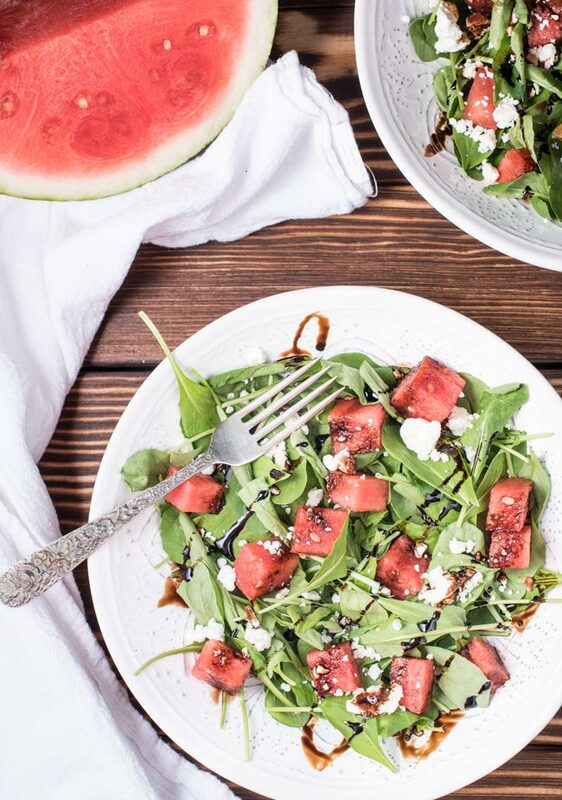 Watermelon has always been the quintessential fruit for summertime picnics, but when you have leftovers or just want a great salad that combines some great flavors then you really can’t go wrong with a feta watermelon arugula salad with a balsamic glaze. The feta, the watermelon, the arugula, and the balsamic dressing all compliment each other so well. Watermelon salads are quite popular. We’re partial to what we’ve come up with below, but we’ll quickly admit there are tons of great watermelon salads out there. Food and Wine has their list of best watermelon salads. And you’ll find other lists as well, but what you really have to do is start making your list! It all starts with the watermelon, of course. If you don’t get that right, you’re sunk before you’ve started. The Kitchn has a few great tips for picking a winning watermelon. Once you’ve nailed that, you’re off to the races and the possibilities are endless. 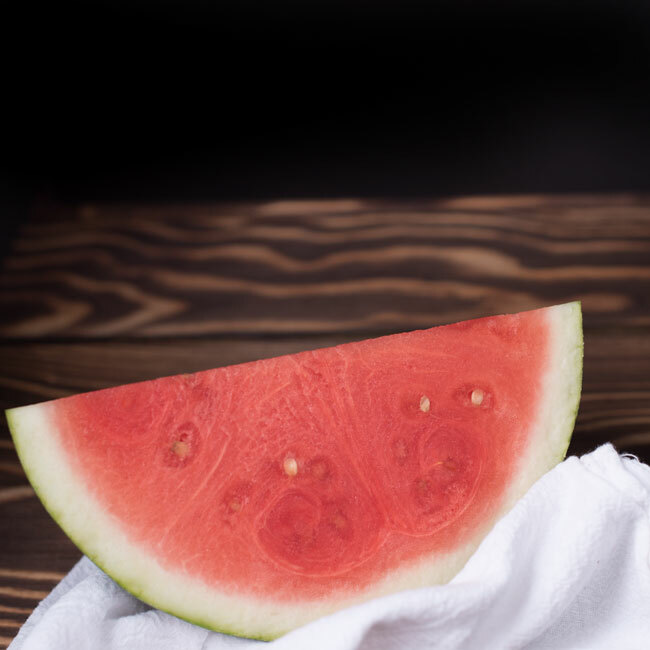 The last couple summers, when we have been out to lunch with family (this does not happen often while raising small children and homeschooling) I’ve tried the watermelon salads that are now popular on most menus. It’s really a delicious summer salad. And not too complicated to make at home. So this provided the needed inspiration to try making one of my own. 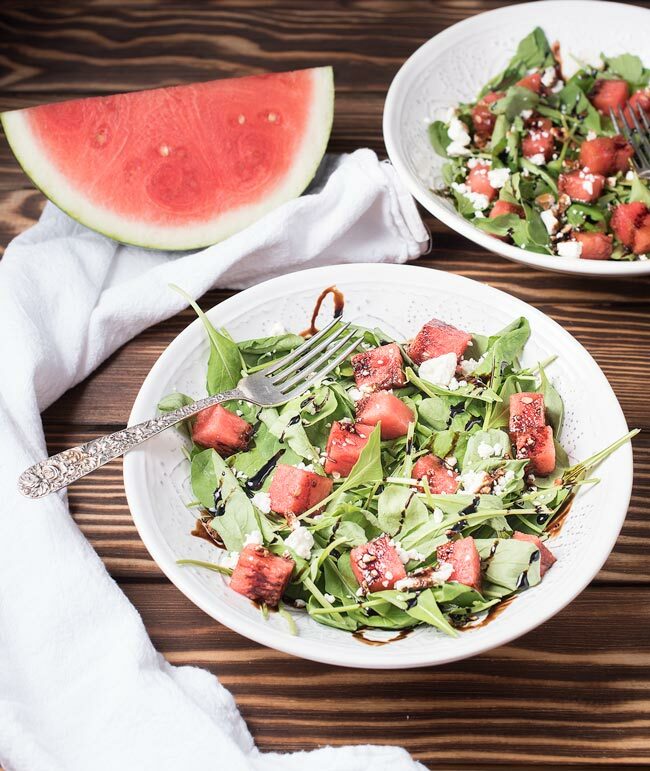 The end result is this salad with feta, watermelon and arugula — finished with a wonderful balsamic glaze. Salads are a popular meal or side for a meal in our house. We have recreated our favorites, like our Panera inspired Asian sesame chicken salad or our quinoa taco salad. 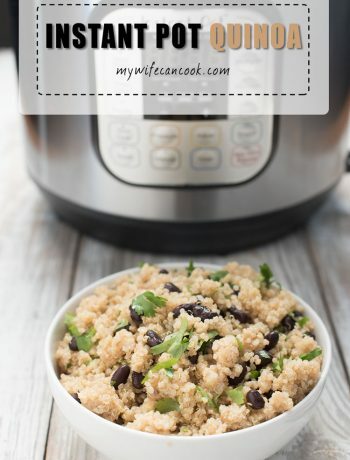 It’s really quick and easy to throw together a healthy meal. 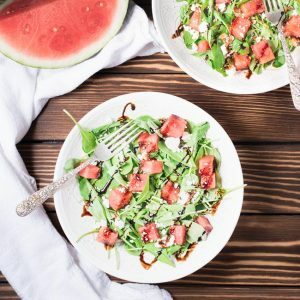 For this watermelon salad, we used baby arugula which we sometimes have available in the garden or from the farmer’s market, but it has also increased in popularity and is usually sold with the salad mixes at the store. I’m sure other lettuce mixes might work as well, but the spicy or peppery taste of arugula really works well with the other ingredients, so we decided on a feta and watermelon arugula salad. Feta was a natural choice. It’s one of our favorite cheeses. We love it on salads and use it in so many dishes, from our Homemade Spinach Feta Pizza to our Spicy Shrimp Pasta to our Easy Chicken Shawarma Bowl to our Tomato and Feta Omelette. Finally, we dressed the salad with a small amount of balsamic vinaigrette plus a drizzle of balsamic reduction or balsamic glaze–which is basically just balsamic vinegar that you simmer for 5-6 minutes until it reduces and thickens. 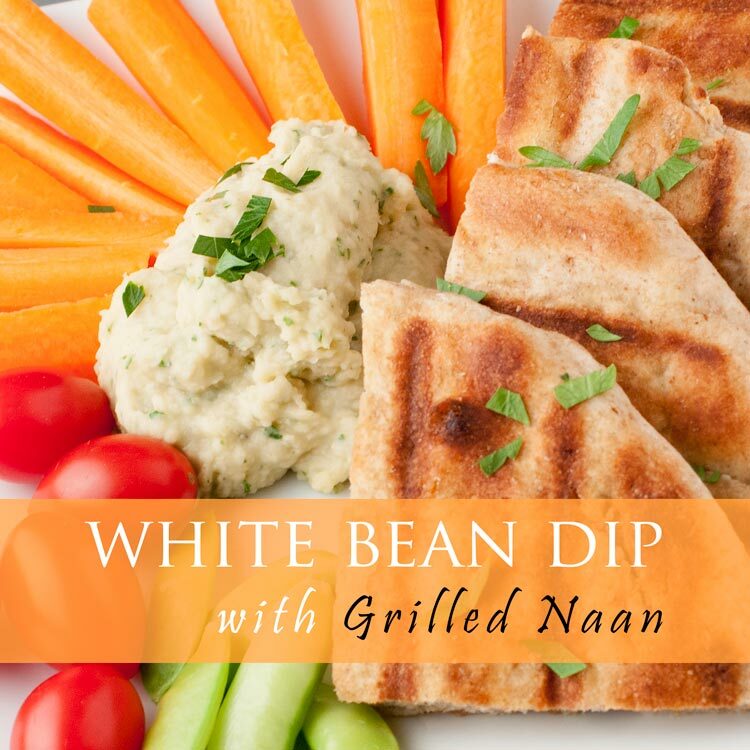 It becomes very sweet and is amazing drizzled on lots of different dishes, from salads and desserts to steak. 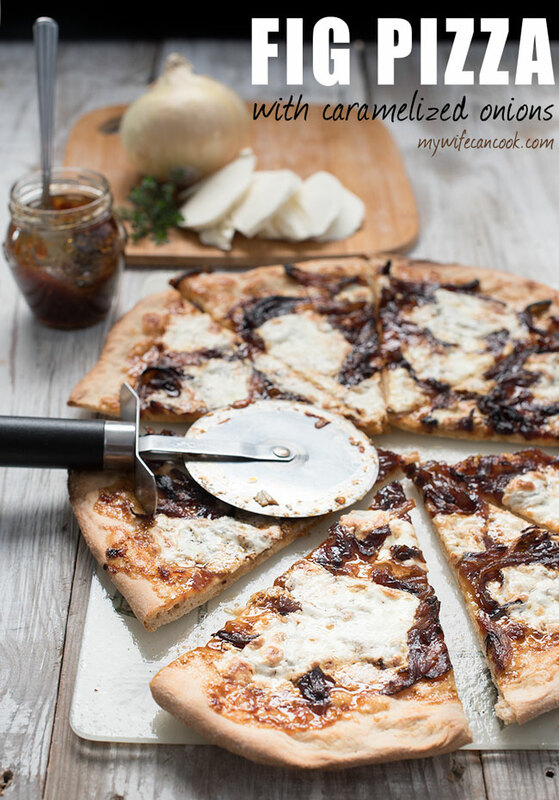 A balsamic glaze has additional sugar added so extra sweet. We skipped the added sugar and just did a balsamic reduction. 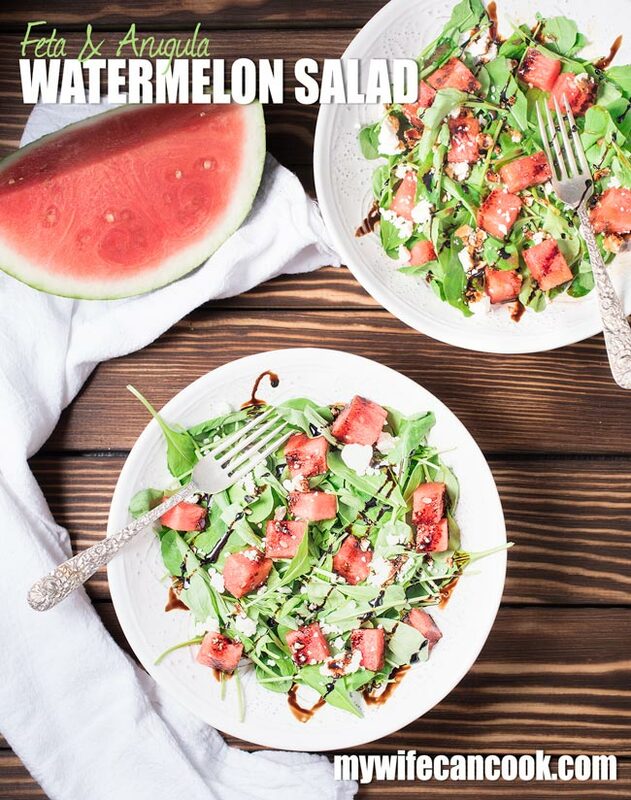 The watermelon does the work for added sweetness in this salad! Enjoy! Arugula salad with feta, watermelon, and balsamic vinaigrette with an extra drizzle of balsamic reduction. Mix and whisk together the vinaigrette ingredients. Simmer 1/3 cup balsamic vinegar in a small saucepan for 4-6 minutes until reduced by half. Let cool. Divide arugula, watermelon, and feta in to 4 bowls. Dress with vinaigrette and drizzle with balsamic reduction.